ExpressVPN Review - Australian VPN Review + A FREE GIFT! Join us today for our ExpressVPN review and a closer look at a sleek and simple VPN ideal for home use. For those who don’t know what a VPN is, a VPN creates a secure tunnel between the user’s computer and the provider’s server, making it virtually impossible for anyone outside the network to see what the user is doing online. Read here (http://www.australianvpn.com.au/what-is-a-vpn/) for more information about VPNs. ExpressVPN has servers in a number of countries including Australia, neatly sidestepping the most common problem with using a VPN from here – the monstrous lag and dial-up-like Internet speeds created when you run your Internet through a server which is most likely on the other side of the planet from both you and the website or service you are connecting to. Their wide network of servers also means that your speed will not change much while you are travelling. During our ExpressVPN review testing, the service’s impact on loading speeds and ping tested out consistently low, so using this service should not have much of an impact on your Internet speed. They they use 256-bit encryption and run on the standard OpenVPN protocol, with support for L2TP and PTPP for high-speed streaming. ExpressVPN has only one account level, which is a nice equal-opportunities approach to selling their service, and a set of impressive multi-month plans. If you pay monthly, you will be paying US$12.95, while a 6-month subscription will run you US$9.99 per month, in the form of US$59.99 every six months. The prize goes to the 12-month subscription, however, where you will be charged only US$99.95 annually, which is only US$8.32/month. They have a variety of payment options including VISA, PayPal, and Bitcoin, and a 30-day money back guarantee. No free trial, but 30 days should be enough to figure out whether this is the service for you. The actual billing amount will always vary slightly, since the billing is in US dollars. The subscription gets you access to unlimited bandwidth and server switches, and access to their suite of apps for Windows, Mac, iOS, Android, and Linux. They allow up to three simultaneous connections, which is not quite the best we’ve seen but good enough to be going on with. ExpressVPN also offers a referral service, which will net you 30 days of free service for every friend you convince to sign up with them. ExpressVPN does not use third-party DNS servers, but runs their own DNS server on each VPN server. This means that you should never be at risk for man-in-the-middle attacks, filtering, censorship, or unwanted advertisement. Their website promises a zero-knowledge, logless service and encrypted DNS lookup. Since they are based in the US, they do log your IP address and how much bandwidth you use, but they don’t keep any record of which sites you visit. Their most impressive feature may actually be their support, however. ExpressVPN offers 24/7 Live Chat support and if you’ve ever had reason to curse the time zone difference between Australia and the US, you know how important that is. Their support has an excellent reputation as well, apparently being friendly, well-informed and efficient, while most Customer Support departments can manage one out of three at best. Their apps are dead easy to install and use, and available for most commonly used OSs including Windows, iOS, and Android. The Android app is smooth and efficient, with a clear and simple interface that fits well with the Android interface. The Windows app is likewise smooth and easy to use, with an efficient one-click setup and an automated speed test feature, which will save time when you are deciding which server to connect to. No third-party servers. ExpressVPN owns all of their own servers and do not farm their service out to third parties. High speeds. ExpressVPN scored well on speed tests, and its impact on browsing and download speeds should be minimal. Unlimited use. ExpressVPN does not throttle or cap your bandwidth, and offers unlimited server switching as well, so you’re never locked into a server that is under-performing. In-house DNS servers. ExpressVPN offers a DNS in their package, making your browsing habits more secure. Secure communications. ExpressVPN makes use of industry-standard encryption protocols. 30-day money back guarantee. While ExpressVPN does not offer a free trial, they do offer a money-back, guarantee, no questions asked, within 30 days. All in all, ExpressVPN is a good choice for the security-conscious user who doesn’t need too many bells and whistles. We hope that you enjoyed our ExpressVPN review. Comments, concerns, questions? Leave a comment below. 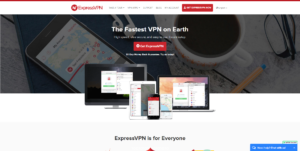 If you are looking for a great, affordable VPN service which does what it advertises without all the bells and whistles, ExpressVPN is your best bet.